You spent weeks creating a very detailed and highly visual journey map. You managed to get marketing, customer experience, sales and the rest of the management team on board. Life seems good. But now it’s time to get back to the ‘real work’ of meeting the KPIs your team is being measured by. Wait. So why did you spend your time creating a beautiful, static picture? 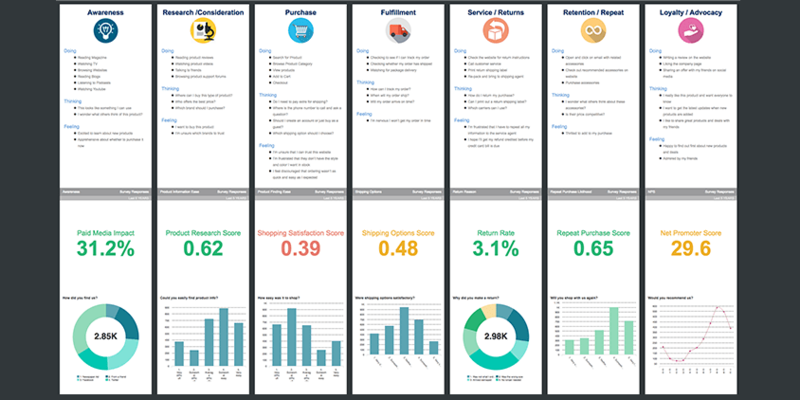 What if you could bring your journey maps to life with real-time data that truly reflects your customers’ real-life experiences and connect them to the hard metrics your company cares about? 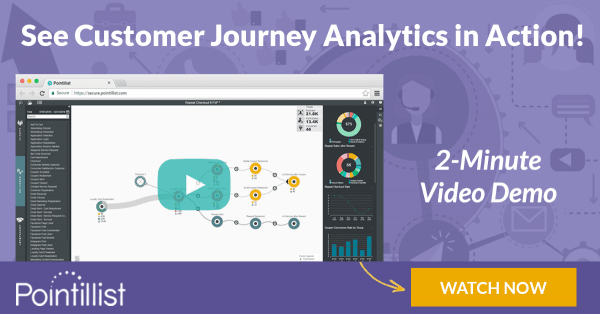 In this post, I’ll describe how to make your journey maps measurable using customer journey analytics. A customer journey map is a visual illustration of the customer’s experience with a business. Journey maps can cover the macro-level journey (e.g. from initial awareness and engagement along the way to a long-term relationship) or zoom in on one or more micro-level journeys, such as the steps to make an online purchase. 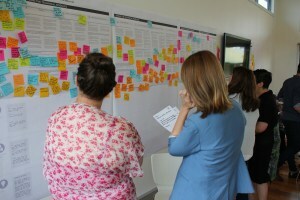 Journey maps typically capture the emotions at each step of the customer’s journey. These can include what your customer is thinking and feeling, as well as an evaluation of the experience at each stage. A journey map can take many forms. It can focus on any part of the journey or give an overview of the entire process. This post on UX Mastery by Megan Grocki does a great job of explaining how to create a customer journey map. Customer journey mapping has been growing in popularity over the past few years, not only with customer experience professionals, but also within marketing, customer service, user experience (UX), and product management. However, the unfortunate reality is that many companies sink a lot of time into creating beautiful looking journey maps that are released with great fanfare only to gather dust, as employees go back to the ‘real work’ that they’re measured by. In order to be actionable, a journey map must evolve beyond a static snapshot of customer experience. It should be both measurable and dynamic. Below are 5 ways you can use customer journey analytics to turn your journey maps into real-time visualizations of your customers’ behavior and its impact on the KPIs your business is measured by. Pictures without data are just stories. Data is what makes the picture come alive. Adding data is the first and most essential step towards making a customer journey map truly actionable. Without data, a journey map is at best a subjective observation of a small number of ‘representative’ customers and at worst a hypothesis made up entirely by various parts of an organization based on their own interpretation of customer behavior. Customer journey analytics overcomes these weaknesses because it bases your journey maps on hard data, rather than opinion. Millions or even billions of individual interactions can be captured over time through a myriad of sources like websites, point-of-sale systems, email marketing platforms, data warehouses, call center logs and even IoT devices. By analyzing all this data in real-time, customer journey analytics gives you a powerful tool to discover the most important customer journeys and prioritize those opportunities that significantly impact your business goals. For example, the figure above shows how customer journey analytics can provide more than just the actions taken by customers. The map indicates the number of unique customers participating, converting or dropping out at every step along the journey. 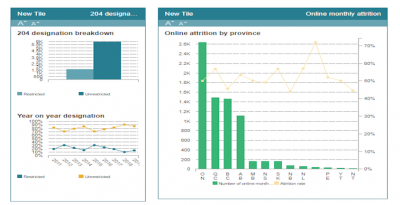 In addition to making your journey maps measurable, this capability can provide marketers with powerful data they can use to pinpoint who to target, what kind of campaign to execute and at what step in the journey to engage. The most common complaint of the journey mapping process is that it is designed in a meeting room by employees with an inward focus, in other words with minimal or (in some cases) no input from customers. Many journey mappers think that involving various teams like finance, R&D and engineering—in addition to the obvious ones likes marketing and CX—will ensure their journey map reflects their customers’ actual experiences. But in reality, what they are really doing is documenting internal processes and calling it a customer journey map. When customer-facing employees put themselves in their customer’s shoes and try to imagine their experiences, it typically results in an imaginary journey that fails to reflect the variety of real-world paths their customers actually take. Even if you conduct focus groups or interview a few dozen customers, you’re not even close to discovering the millions of real, unique journeys taken by your customers. Customer journey analytics does the hard work of collecting actual customer data from a variety of sources such as marketing automation platforms, websites, mobile apps, data warehouses, call center logs, e-commerce platforms and point-of-sale systems. It integrates all this myriad data and performs customer identity matching to determine which interactions are actually being performed by the same person. In this way, customer journey analytics reveals the numerous paths your customers actually take, as they engage with your company across channels and over time. Journey maps typically convey a few, representative journeys. In reality, every one of your millions of customers takes their own unique journey that may be similar or differ wildly from your prototypical version. Customers zig and zag through different paths even as they reach the same end goal. Different customers, even those with the same ‘buyer persona’ type, move along at their own unique pace. Journey mapping assumes the same cadence for all customers and therefore misses out on opportunities to interact with individual customers on a one-to-one basis through personalized engagement. Customer journey analytics, by triggering real-time engagement, helps nurture customers with different cadences along the journey. Customer journeys are also interconnected—jumping multiple times across online and offline channels, and even intertwining with other journeys. For instance, a customer journey to resolve an issue, if handled well, could result in a cross-sell of a new product or an up-sell into a higher value plan. Journey maps don’t help you discover such real-world, unscripted customer behaviors. Customer journey analytics can help you solve these problems by revealing the wide variety of real paths that customers actually take across channels and over time. Then it helps you identify the most important journeys by whatever metric you may choose, e.g. repeat purchase rate, loyalty engagement, conversion, new customer acquisition or overall impact on revenue. 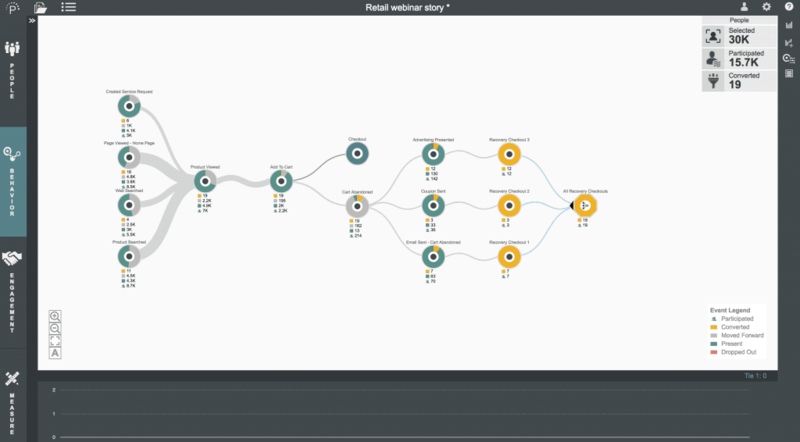 By using a customer journey analytics platform equipped with sophisticated machine learning algorithms, you can quickly discover important events within a journey, for instance the most frequent paths customers take from Point A to B along the journey. Moreover, it gives you the ability to predict customer behavior in real-time and decide on the most appropriate method of engagement. In the diagram above, machine learning algorithms are used to sort through millions of actual journeys to reveal the most significant paths that customers took between viewing a product online and checking out. In a marketer’s hand, this is powerful information that can be used to significantly boost campaign results. The best part, though, is that this analysis can be done easily and quickly by marketing and CX teams without the help of data scientists. While modern journey mapping tools can help you create visually compelling journey maps, it’s extremely tedious, if not outright impossible, to use journey mapping techniques to flesh out and visualize all the detailed steps that make up specific parts (i.e. a micro journey) of your overall macro-level customer journey. 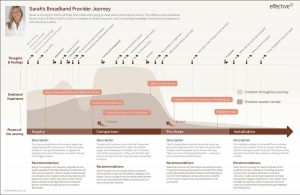 Let’s take for example, a typical customer journey in the telecom space. A telecom service provider creates a journey map for a macro-journey depicting customer acquisition. This journey map will likely include the following stages—Inquiry, Comparison, Purchase and Installation. The map could include thoughts and feelings at every stage and provide a description of what the customer is doing. 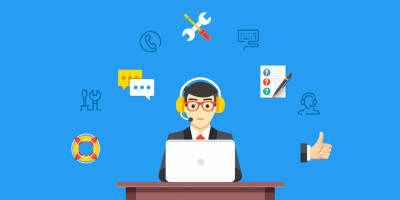 Now let’s say the company realizes that customer experience during the installation phase is resulting in high number of calls to the customer care center and poor customer service scores. The static, macro-level journey map is inadequate for analyzing this situation and testing the impact of various improvements. 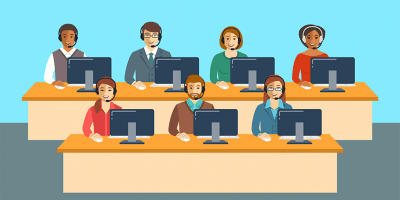 By implementing this macro journey via a customer journey analytics tool, this telecom provider can quickly drill down to uncover the micro-journeys that are resulting in customer care calls.This analysis reveals the paths customers take before they call for help. Moreover, the customer journey can be tracked all the way to the actual service disconnect, so you can determine which self-help mechanisms are resulting in the highest failure rates. Customers today expect personalized, relevant information and offers driven by their preferences, recent interactions and latest product and support experiences. They are ready to abandon their journeys with a single poor experience. Companies cannot afford to falter or even provide a sub-par interaction at any step along the entire customer journey. To deliver, companies need to connect millions of data points and analyze customer journeys in real-time, so that they can provide each customer with a personalized experience based on their own unique preferences and personal journey. You can’t engage with your customers in real time via a static journey map. So, the typical solution is to create a stand-alone, rules-based system to code all the ways you wish to engage with your customers. However, traditional rule-based tools are notoriously difficult to manage and can’t help you uncover the unscripted customer behaviors that occur in the real world. Customer journey analytics enables marketers to identify opportunities for real-time engagement based on a deep analysis of customer behavior. It gives you the power to identify at-risk customers before you lose their business. It lets you connect the dots between customer interactions and business outcomes in seconds, rather than weeks and months. When you implement a change that affects the customer experience, you need immediate and constant feedback to determine the impact of the change. Customer journey analytics platforms can spot different behavioral patterns and interactions in real-time, even among anonymous visitors, so you can engage each customer with a personalized offer. Journey maps are good for internal communication and aligning employees around a common, customer-centric approach. But how do you resolve poor customer experience issues? Where do you start? 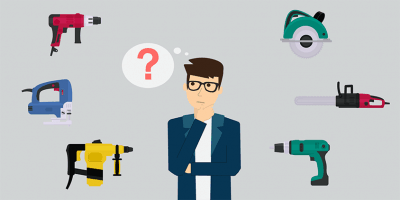 Or if you need to boost new acquisition, how do you target and personalize offers for unique customers? Customer journey analytics enables marketing and CX teams to not only discover which journeys are most important, but to automatically engage with each customer at the best time, through their preferred channel and in a relevant, personalized way. By embedding triggers at any event along the journey, you can activate engagement (such as an email send) to your target customer group within a specific event—customers who converted, those who moved forward or even those who dropped out at a particular point in the journey. These real-time engagement triggers are a lot easier to manage and more effective than rule-based, coded systems of the past. 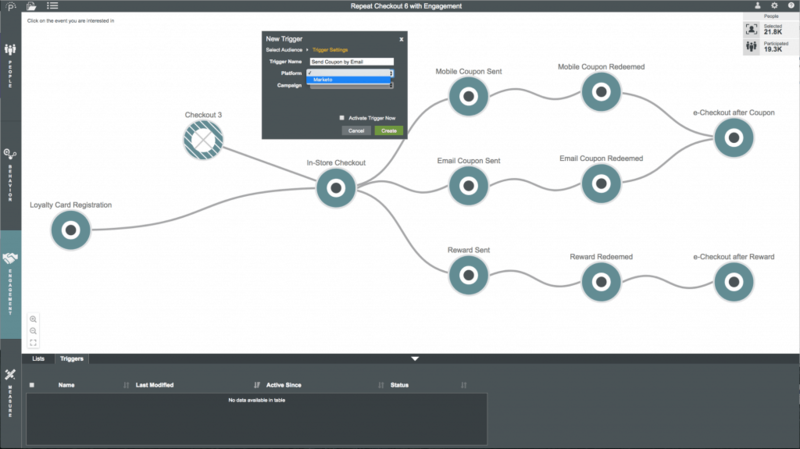 Advanced customer journey analytics platforms integrate with commonly used marketing tools, so you can engage with your customers using your existing marketing technology stack. The result is a new level of performance for marketing and CX campaigns through significantly better precision, targeting and timing. A journey map is a static picture, frozen in time. Even if you make changes based on an understanding of your customers’ journeys, how do you measure whether they’re working or not? How do you make your journey maps measurable, so you can see the impact of your changes on the KPIs you’re being measured by? 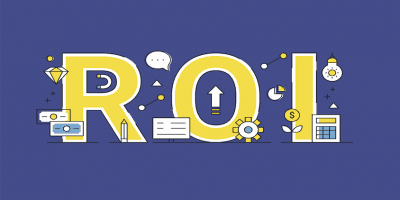 Customer journey analytics can provide a quantitative link between customer experience and hard metrics like revenue or profitability. 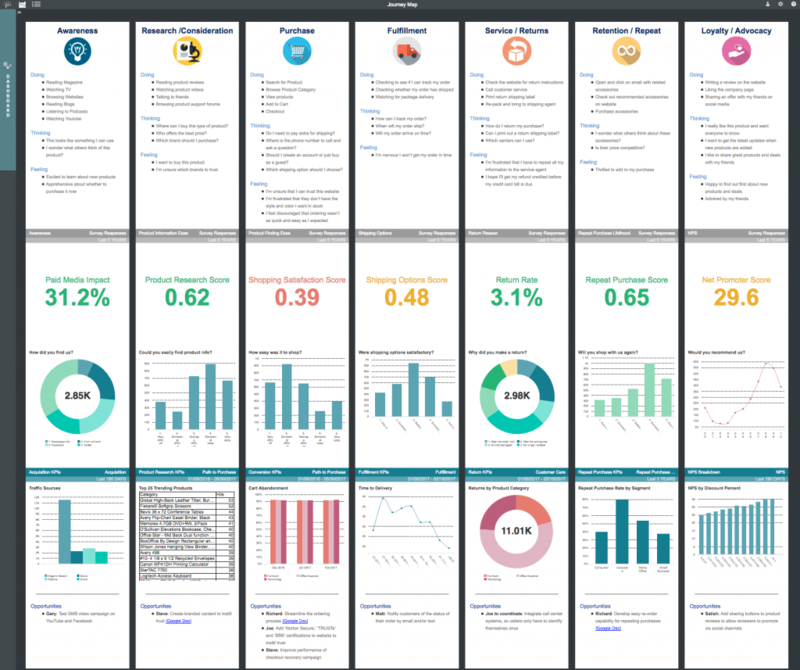 It makes your journey maps measurable by turning them into live dashboards that combine qualitative insights with real-time updates on your most important business KPIs. The right measurements will help you evaluate your customer’s experiences at every touchpoint as well as the impact those touchpoint experiences have on your business. If the customer’s experience changes, either positively or otherwise, you want to have a way to know it. And you want to understand what impact those changes are having on the business. Companies can no longer afford to navigate marketing and customer experience using journey maps based on a static and fuzzy perception of customers’ real-world behavior. It’s time to make your journey maps measurable by discovering real, unique customer journeys and acting on them as they happen. Your customers won’t settle for anything less and neither should you. @Steve, I really enjoyed reading this post and felt a lot of resonance with your criticisms of many journey map efforts. I help clients discover customer outcomes and journeys by using agile digital ethnography, which provides real quantitative data along with qualitative insights, and it also makes obvious that there is no “customer journey” because, as you say, each customer’s path will be different. I tire of reading references to “the customer.” This may sound like a nit, but it’s important to realize there is no mythical customer, only individuals. Real data shows the fallacy of lazy habits. Of course, I realize that your platform enables collecting and acting on customer data; how do you apply it to potential customers for whom you have no transactional data? My clients are interested in existing customers, of course, but also in potential customers. Great question, Chris. Pointillist’s Autonomous Identity Matching™ approach was designed to enable you to seamlessly analyze the behavior of both anonymous visitors and known customers. And the moment data exists that identifies an anonymous visitor (e.g. from a form-fill on your website), the connection is recognized and the known identity is joined with all previously anonymous historical data. The result is that all current and future analyses, dashboards and even behavior-based triggers will reflect the customer’s behavior all the way back to the beginning of their previously anonymous interactions.